We relish the excitement of Mercedes Benz Fashion Week Fall 2012, as a dizzying, somewhat dyslexic time, when we bundle up in our winter's wool and fur, while bustling by the boutiques on Madison and Fifth Avenue, brimming with the bright fashions of early spring and resort, simultaneously scurrying to survey the styles sashaying the runways for next fall. We relish the excitement of Mercedes Benz Fashion Week Fall 2012, as a dizzying, somewhat dyslexic time, when we bundle up in our winter's wool and fur, while bustling by the boutiques on Madison and Fifth Avenue, brimming with the bright fashions of early spring and resort, simultaneously scurrying to survey the styles sashaying the runways for next fall. It can give a girl a fashion identity crisis. Training for this week when fashion's favorites come together is like anticipating in an athletic event. Spare time can be the enemy so we prep the week before by working out, taking lots of Vitamin C in hopes of fending off the flu, and getting to bed early to stockpile the sleep. Next, we figure out what to wear to be chic and comfortable, day to night. We tend to keep it simple and comfortable, except for killer heels of course. Definitely a dress that will transition from day to night, with a few choice accessories. Since it can be chilly at Lincoln Center, we like a sleeve or a little weight to the fabric and knits are especially versatile, looking as fresh in the Box at 9:00 AM as in does in the Bar at 9:00 PM. Nothing beats the ease of a dress - you slip on, zip up and go - absolutely fuss-free. Black is always in style, especially in New York, in fashion and in February. This Ralph Lauren silk blend is a perfect choice. To punch up the look, we chose the J. 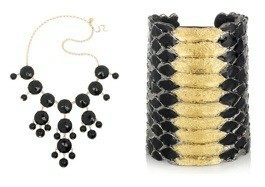 Crew Statement Necklace and the killer cuff by Yves Saint Laurent. We like jewelry you can see. 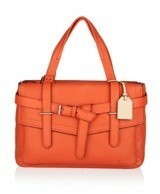 For our go-to bag, we went for the pop-of-color that is on trend this season, like this Reed Krakoff Boxer Tote. It is big enough to hold all your essentials, additional make up for evening, jewelry for refreshing a look, plus a camera, and a wrap in case it gets drafty. Also must be roomy enough to stash the free samples from Figi Water and other sponsor goodies, and tough enough to stand up to abuse. For shoes we always recommend the highest heel you can walk in, and with the platform on these Gucci suede pumps, we can kick it up a notch. Once we have our look in place, we can go about our real business of the week, obsessing over what others are choose to wear, both on and off the stage. From the front row filled with the very best-dressed elegant editors, to the lovely ladies who live for the latest, to the young and the beautiful assistants, stunning in head-to-toe black, including headsets, to the young bloggers, so finely cutting the edge of fashion, we are ready to report on the trends and styles that are here now, here to stay and here very soon.